Saving Animals During Disasters is so excited to announce the sixth annual SALTY PAWS FESTIVAL to take place around the beautiful Carolina Beach Lake on October 18th. ALL proceeds go to help in the care and medical needs of so many neglected and abused animals. 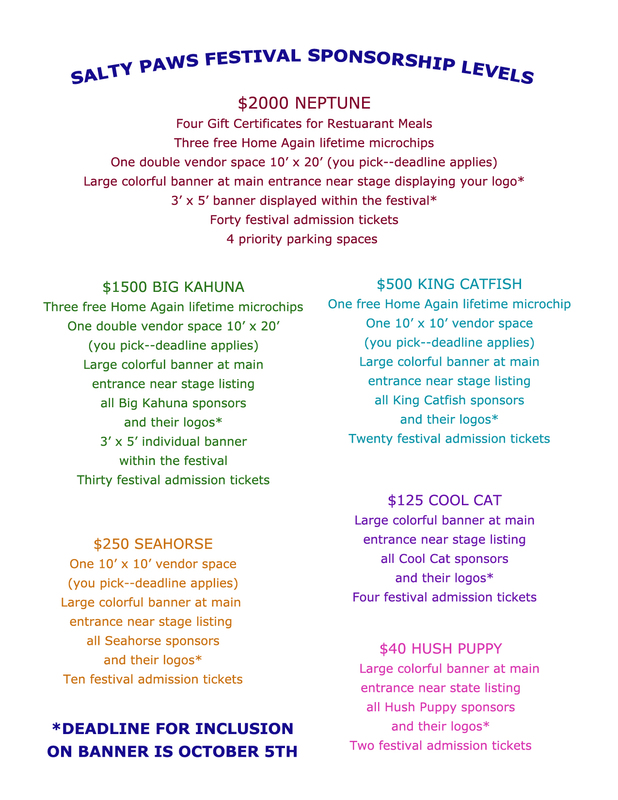 The SALTY PAWS FESTIVAL is hosted by Saving Animals During Disasters, a 501c3 non-profit organization whose goal is to aid in the rescue and support of disaster affected animals. As we have learned, disasters can be natural as well as man made! The first five Salty Paws Festivals, which were held in October of 2009 through 2013 around the lake, were HUGE successes, drawing crowds of approximately 3000 people, 75 vendors and more pets than we could count! We’re expecting an even larger turnout this year. The festival will have music, food, pet contests, pet adoptions, and lots of activities for adults, children and pets. Many vendors have already expressed interest in participating. All applications will be treated on a first come first served basis, so I encourage you to respond as soon as you can if you want a space. There are plenty of electrical outlets around the lake, but spaces with water are very limited. We hope you and your family will join us for a fun-filled fall day around our beautiful lake. (This lake is the closest freshwater lake to the ocean on the east coast, and the ocean is across the street!) Don’t forget to bring your pets too. See you there!